(Monrovia, May 23, 2018)- The Press Union of Liberia is monitoring a weird criminal coercion court action against Journalist Eric Oldpa Duoe and two others in Yarpah Township, Rivercess County. Early Thursday, sheriffs from a Magisterial Court in Cestos served a writ of arrest on Journalists Oldpa Duoe, Saturday Jududoe and Stanley Wrehdhu for criminal coercion for alleged defamation against an individual identified by the court as Private Prosecutor, Victor Wilson. Mr. Eric Oldpa Duoe, Saturday Jududoe and Stanley Wrehdhu are all employees of ECHO Radio of Yarpah Town Rivercess County. The Magisterial Court’s Writ of Arrest alleged that the reporters “without any color of law, criminally, maliciously, and intentionally published on the media outlet of the ECHO Radio, fictitious and accusation that the Private Prosecutor did engage into the sale of a yellow machine which according to the defendants, during their radio talk-shows, and other programs, actually belongs to the people of River Cess. The Press Union of Liberia views the court’s action against members of the Journalism Community in Liberia as the commencement of a ploy to intimidate journalists in the south- central region of Liberia through an awkward legal form of action. It is unacceptable that the rights of journalists and media workers are continuously being violated through different court actions, the Union stresses. On Monday, 9th April, the Office of FrontPage Africa (FPA) was raided on the orders of authorities of a Monrovia Civil Law Court when sheriffs arrested all the papers’ employees including cleaners and an expediter. Meanwhile, the Press Union of Liberia is most respectfully drawing the attention of the Supreme Court of Liberia and the Liberia National Bar Association to the situation in Rivercess. 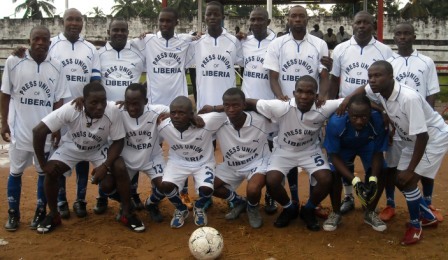 Liberia signed the Table Mountain Declaration on 21, July 2012 vowing to repeal criminal defamation or 'insult' laws. Almost six years on, journalists are still being harassed, frightened and persecuted by meanly political leaders of the country using criminal defamation as means of silencing critical voices.